(Bloomberg) -- Greek pensioners have seen their payouts slashed so much, some of them are moving to one of the poorest countries in Europe. Greece, which is among retirement destinations for other Europeans, is finding its own citizens -- like George -- are now looking to live out their senior years in the country’s cheaper northern European Union neighbor after seeing their pensions cut at least 20 times during its protracted debt crisis. Greece’s budget, submitted to the European Commission on Oct. 15, includes a scenario without pension cuts agreed to and pre-legislated in 2017 after months of back and forth negotiations. The government believes the country can meet its target of a budget surplus before debt service of 3.5 percent of gross domestic product without such cuts. A decision on the matter will be taken by the end of November, according to a European official. In the meantime, Greek pensioners are making a rational choice by moving to Bulgaria. 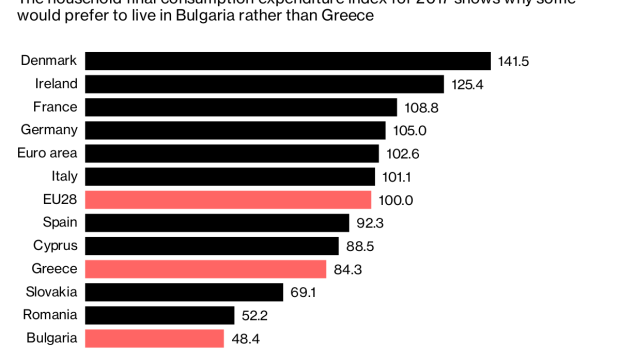 In 2017, according to Eurostat data, Greece’s cost of living was almost double Bulgaria’s -- which was the lowest in the EU. Bulgaria joined the EU in 2007 and has grown at an average annual rate of 2.4 percent since then. That year was the last that Greece’s economy grew before a sovereign debt crisis wiped out a quarter of its economic output, sent unemployment soaring and left the country at times teetering over the abyss of a euro-exit. Bulgaria, the ex-Communist nation of 7 million people remains the EU’s poorest member state. By July 2019 it hopes to join ERM-2, the waiting room for entering the euro area. It fulfills the formal criteria to become the euro region’s 20th member given its solid public finances, although inflation zoomed up to a five-year high of 3.6 percent in September, which could complicate its path. Still, those price rises aren’t enough to concern Nikos. The 71-year-old Greek national, who also didn’t want to give his surname, points to bread costing 60 euro-cents, restaurant meals rarely exceeding 10 euros and rent of 200 euros for a one-bedroom apartment in a good neighborhood for why he’s living out his retirement in Bulgaria. Nikos has seen his pension slashed by 45 percent during the crisis to 1,100 euros, and could see it cut further if Greece’s euro-area creditors compel Tsipras’s government to push ahead with more pension cuts.